Enterprise Tondelli have experience of all of the above. Depending on the line configuration, speed required, space available Enterprise Tondelli will supply either low or high level bulk palletising equipment. 30 layers per hour would be a low level semi automatic machine. Any speed in between which could be high or low level. Inflatable tubes type heads. This can be fixed or adjustable pitch. High level empty can palletising at 2,400 cans per minute with top frame and strapper device.. 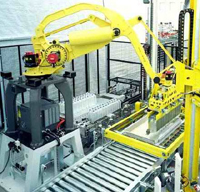 Robot palletising equipment with magnetic head for palletising bright cans as a buffer for a pet food can factory. Inflatable tube machine with all conveyors for a glass factory. 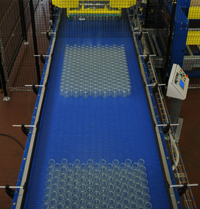 Whatever your requirement Enterprise Tondelli supply the solution include the conveyor feed system if required.